NEPA Alliance presented small business loan funds to the Veterinary Referral and Emergency Center (VREC) in the amount of $75,000 from the Economic Development Administration / NEPA Revolving Loan Fund and $50,000 from the Appalachian Regional Commission (ARC) Loan Fund for the purchase and installation of an MRI (magnetic resonance imaging) unit in conjunction with the start of their neurology service. 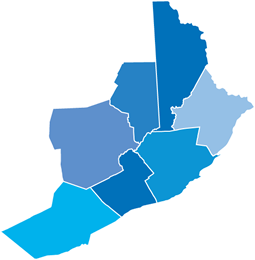 These are two (2) of the eleven (11) economic development loan programs administered by NEPA Alliance. Other financing in the project included Fidelity Deposit & Discount Bank. The Veterinary Referral and Emergency Center, founded by Dr. Nichole Danova, offers distinctive and comprehensive veterinary services. Since opening its doors in May 2010, VREC has expanded to 57 veterinary trained staff members in order to best meet the needs of their patients, clients and referring veterinarians. VREC is a 24-hour, multi-specialty referral and emergency center in South Abington Twp. For more information on the NEPA Alliance Business Finance Programs and services, contact Dave Nat, Business Finance Manager, at dnat@nepa-alliance.org or Paul Macknosky, Business Finance Specialist, at pmacknosky@nepa-alliance.org. Photo Caption: First row, from left: John Dorneman, Fidelity Deposit & Discount Bank; Trip Crowley, Fidelity Deposit & Discount Bank; Gino DeGiosio, PNC Bank; Jack McNulty, PA Dept of Labor & Industry; Dr. Nichole Danova, Veterinary Referral and Emergency Center; Dave Nat, NEPA Alliance; Jeffrey Box, NEPA Alliance; Commissioner Jim Wansacz; Lackawanna County; Phil Condron, Condron & Company and Jack Ferrett, Fidelity Deposit & Discount Bank.